This is a delicious creation and best seller. Ideal for gourmet bread dipping or cooking. Use for garlic bread, shrimp scampi, chicken, rub on steak, scallops, white fish etc. Garlic mashed potatoes are delicious. We could discuss this product for hours. It's easy just add 2 tablespoons of water to the blend, mix and wait a 3-4 minutes to absorb. Add 3/4 to 1 cup of 100% pure olive oil (do not use extra virgin) and stir. You now have the best tasting garlic butter blend to use in so many ways. Blend right into your mashed potatoes for delicious garlic mashed potatoes. 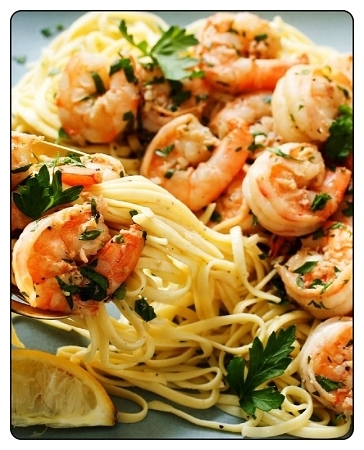 For shrimp scampi pour in enough to cover you frying pan,heat/saute the cooked shrimp and when ready, toss in your cooked angel hair pasta emptying the remaining garlic butter mix into the pasta. 1 8oz. bag shredded Mozzarella cheese. Slice either Italian or French bread. Mix the garlic butter package as directed with water and olive oil. Then brush on bread slices. Cut a piece of roasted red pepper and put on each bread slice. Cover with Mozzarella cheese and bake until cheese melts.